Enlist the help of a solidly built galvanized steel tub to hold a decent supply of wood next to your fireplace. Think of the possibilities for what it can contain. 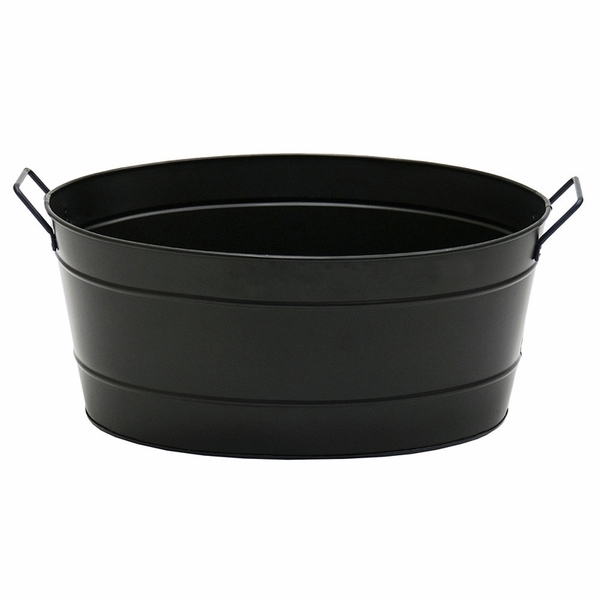 This shiny steel tub with a strong handle for easy carrying can be filled with ready to burn wood, pellets or coal, will look smart and also keep your kindling neat and orderly. Maybe two tubs will be the ticket - one for ready to burn kindling and the other for carrying hot ashes or coals outside safely. Invest in this shiny fireside accessory or give one for a gift at Christmas. Your loved ones will appreciate it! Per the manufacturer, this item measures 21 inches in length, 15 inches in width, and 9 inches in height. This item was shipped in a timely manner. Seems to be well constructed. ProsIt helps keeps dirt from the wood contained, off the floor. It's ok, does hold wood, and keeps from storing wood on the floor. ConsTub could be a little larger length wise. A little pricey with the shipping cost added. It's ok, but would not have purchased if I had seen it first. For smaller fireplaces, this will store more than enough wood. If you have a bigger fireplace, you will have to take many trips outside. If you are going to put this directly on hard wood flooring, I recommend against it. If you can set it on something soft, it is fine, but I feel it would scratch the wood. Also, don't overload it or you might damage it. We were very tired of having to clean up those little bits of wood that always seem to accumulate around fireplaces. The closed sides of this tub really keep the floor clean, and they allow us to get a bunch of kindling in there as well. It also matches black fireplaces superbly. Getting a product that is functional and attractive can be a difficult hunt to say the least. This tub delivers on both accounts. The Shape makes it very easy to carry even when I have it completely full of large pieces of wood. I also think the shape makes it appear much smaller when sitting in next to my fireplace (which is very nice, since it doesn't clutter everything up). It also feels like it took take a beating without any damage, so I will be able to get plenty of use out of it. Overall, a nice addition to the fireplace. When I was looking for a good wood tub, I wanted one that would give my stove that extra little something to make it look homey. I was worried about how bright the enamel coating on it was, because I have had things with a similar coating that would crack and flake. I was very surprised by how durable the coating itself is. I tend to do a lot of carrying back and forth from the wood pile, so the sturdy handles were quite a nice addition to an already lovely tub. I do have to say, if you are looking to bring in a whole tree at a time when using this tub, think again. It is probably only suitable for getting a bunch of smaller logs and then adding kindling in to start the fire. In all honesty, I was looking for something bigger, but this is a great tub.